FNB Wits lost to FNB NWU in the Varsity Cup quarter finals. 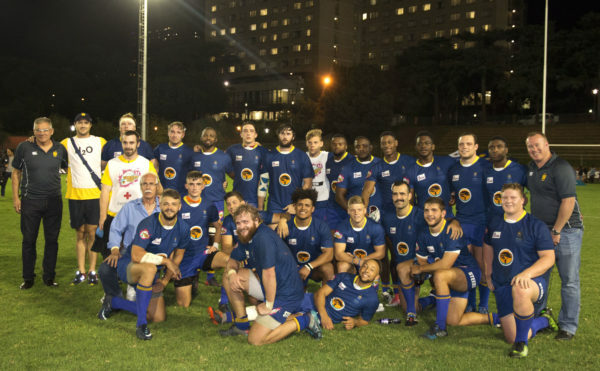 Despite fans coming out in their numbers to show their support for FNB Wits at the Wits Rugby Stadium last night, March 19, the team was unable to secure their place in the Varsity Cup semi-finals. FNB NWU walked away with the honours and the second place on the log after a nail-biting finish to the match, 35-31. Wits still has a shot at the semi’s though as the team remains on 25 points and in third position on the log. The outcome of next week’s clash between UJ and UCT will determine if Wits move to the next stage of the competition. NWU dominated the first 10 minutes of the game and opened up the score board with a penalty try. Wits’ fullback, David Cary, later converted a try which placed Wits on the scoreboard. The first half ended with Wits’ CJ Conradie scoring a try but the Braamfontein outfit still trailed NWU 12-26. The second half saw Wits start strong and attack well. Wits’ lock, Connor Brockschmidt, was seen darting through the defence for a stellar try taking the score to 19-26. As fast as Brockschmidt was in scoring a try, so were the NWU team who came flying back with a response and a successful conversion which left the scoreboard at 19-35. The fast-paced game saw a second successful try by Cary but not a conversion. The score was then narrowed to 31-35 when Wits’ CJ Greef scored another try for his team successfully converted by Chris Humphries. Wits kept up the pressure on the team from the North West but the latter remained steady and consistent, walking away with a well won victory. Wits head coach, Hugo van As, told Wits Vuvuzela, “Obviously we’re disappointed because it was pretty close and we had great opportunities to win it.” He added that his team “did fantastically”. Wits captain, Constant Beckerling, told Wits Vuvuzela, that the teams’ ‘balls of steel’ are still intact. He added that the team “is privileged to represent Wits” and are thankful for all the incredible supporters who have come out to watch their games and support [them] this season. Should Wits qualify, they will participate in the semi-finals on Monday, April 2. FULL TIME – the titanic battle for second place on the log ends with @theNWU getting the win in a great contest.